Our party experts have lots of parties under their belts and can help make yours amazing and fun for kids and adults alike! Our Parties are appropriate for up to 20 kids (30 for Platinum package) and must be done indoors. If you are holding an outdoor event or planning for a larger group, click here to learn about our special event shows! Looking to book your next birthday at our DUMBO Fun Loft Space? Please call for more information! Two Mad Scientists to arrive 30 minutes prior to party performance, one to assist with setup. Mad Science name badges for all guests. Our Gold & Platinum Packages can be designed to fit your schedule. We can help you plan your party’s events and timeline, and we can be very flexible with the order of events (ie: making the take home experiment after food service, doing the finale before or after cake, etc.) Please feel free to contact us for more information on creating the ultimate Mad Science party experience! One-hour Slime Party with Awesome Slimy Demos and Hands-On Slime Making. Polymer breakdown – learn the secrets behind making amazing slime! THREE different take home slime varieties for all guests, including traditional, glitter, and snowball. Manipulate matter in all of its three states! Freeze water with just a breath of dry ice, and cool off with our spectacular demonstrations! Check out the "Big Burp," the "Screwdriver Sizzle," and the famous "Mad Science Bath," all as we explore the science behind this amazing frozen gas. Use your own Thermocolor Kool Cup take home to test the temperature of liquid matter in your home. Click here to request a party! 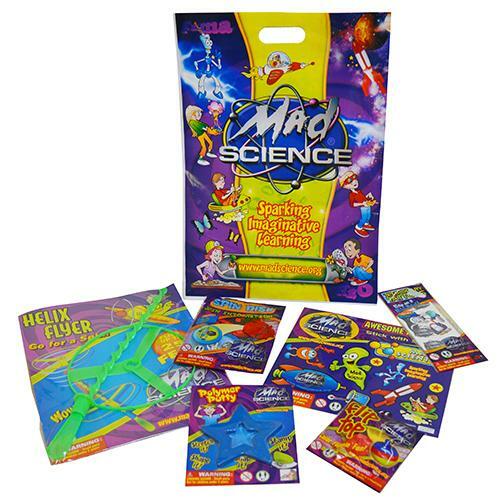 Or click one of the links below to learn about having your Mad Science Party with one of our awesome partner locations! 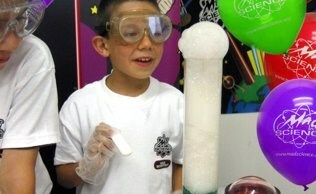 Bubbling Potions-For an extra special Mad Science experience we will mix up some bubbling potions using dry ice. Witness our most famous elixirs like the Mad Science Bath and the Big Burp. For the grand finale we'll fill the room with our creepy low-lying fog, just like in the movies!!! Rocket Launch- Blast off with this exciting and innovative upgrade. This is no ordinary rocket launch. This fuel powered rocket can blast up to 300 feet - leaving a trail of lasting impressions! This requires an ample outdoor space and therefore is only available in Westchester (Outer boroughs at Mad Science's discretion). Should weather be inclement a $50 credit will be issued and other experiments will be done in lieu of the launch. Or you can book BOTH finales for any of our packages - only $50 more!